Every once in a lucky while, you find a cookbook that's entirely cookable. And if it's an entirely readable history lesson, too? Foodie Heaven. 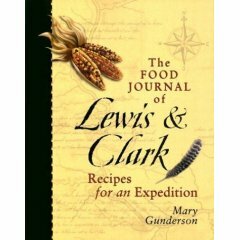 In 1804, Meriwether Lewis and William Clark launched the great exploration of the new Lousiana Purchase. The food logistics alone were enormous: there were no Safeways, no Whole Foods along the traverse of the Missouri River. How and what DID they eat? Well and a lot, it turns out, very well and a whole lot. The Food Journal of Lewis & Clark by Mary Gunderson describes the expedition in terms of food, applying what Mary calls paleocuisineology -- bringing history alive through cooking -- to make a history book with recipes. SO ALANNA ... WHAT ABOUT THE PARSNIPS? ... Roasted parsnips are wonderful! And the pine nuts are a natural complement. THESE roasted parsnips, too bad, were woody, no fault of the recipe. I'm finding it hard to tell when to cut out the center cores and when not, a discussion that also happened on Day 319. I think I will, from now on, just in case. NEXT TIME ... I'll use fewer pine nuts since they're expensive price-wise and calorie-wise. Just a few would have been enough. FROM THE ARCHIVES ... I know the roasting season is coming to a close but for cold-ish spring days, there are lots of roasted vegetable recipes in the Recipe Box. Preheat the oven to 400F. Toss the parsnip pieces, olive oil, salt and pepper to combine well and transfer to a rimmer baking sheet. Roast for 10 minutes. Reduce temperature to 350F and stir in the pine nuts. Roast another 20 minutes (or more) until golden, stirring occasionally. (I was busy and didn't stir. It didn't seem to matter.) Season again and sprinkle with malt vinegar. Serve and enjoy! To keep the pieces of roughly equivalent size, you might want to core only the thicker stem ends. To do this, first slice the thin root ends in one-inch pieces -- you might only get one or two. Then quarter the thick section, slice out the woody cores, then slice into one-inch pieces. Many thanks for the book title! We're always in search of this kind of book - it looks ideal for our pre-dinner reading aloud sessions. And parsnips and pinenuts... that looks delicious as well! Pinenuts can be so tricky, can't they? They go rancid so quickly. We have found an excellent source for pinenuts though (Kensington Market in Toronto - dried beans and fruits lady on the north side of Balwin) I don't know how she does it but her pinenuts are always fresh and WAY less expensive than supermarket pinenuts. Nice post...but...no Safeways? I don't believe that for a a second! The dish sounds great too...and timely, as I have about five parsnips in the fridge with no plan (bought a bag of them for another recipe but it only took one)...so, a-roasting we will go! BTW, Elizabeth, even though they're never refrigerated in the stores, I always keep pine nuts in the fridge - I think it keeps them fresher longer. Hey Alanna and pille, ejm, and stephen. Have you tried pine nuts in basil pesto? They do this in Chile where they can shoot--yes shoot--the pine cones from the trees in the back yard, break out the pine nuts and then prepare heavenly pasta with pesto. Wow! Great recipe! This combination sounds awesome. I've heard that about pinenuts, Stephen. I've even heard some people recommend to freeze them so they don't go rancid. Mary, there are 3 or four dried beans and fruits stores on Baldwin. The lady we go to is the middle store beside the Mexican store. She also makes terrific baklava and always has very fresh walnuts on hand. Have any of you tried Nigella Lawson's amazing "Tagliatelle with Chicken from the Venetian Ghetto" that calls for roast chicken, Sultana raisins and pinenuts? Well so far the suggestions range from frig to freezer -- and I have no trouble in the pantry! Maybe because they go into a glass jar? Hmmm. BTW Elizabeth, I figure L&C weren't worrying about their pocketboks -- the taxpayer dime after all =-)-- but also weren't worried about their waistlines! I'd never done nutritiion analysis on pine nuts. Yikes! i am glad to have found your site. i am going to make this dish for a birthday party on sunday. 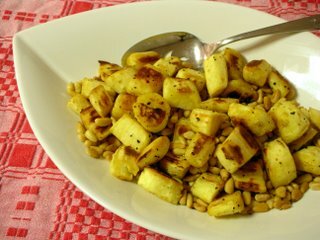 i love pine nuts and use them all the time. they are great toasted and added to a green leafy salad. i think i'll even toast them a little before adding them to the parsnips. yum yum!